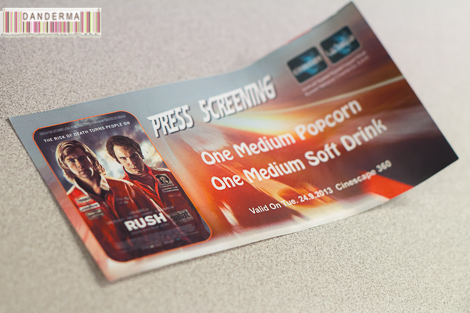 I received an invitation to attend the advanced screening of the movie “Rush” by Cinescape which took place yesterday and since I love everything movie related I was on my seat at 8:15 P.M. sharp waiting for the movie to start. Frankly, I didn’t know what the movie was about because I have a policy regarding not watching trailers anymore but I knew it was about car racing, based on a true story, its soundtrack is composed by Hans Zimmer, is starring Chris Hemsworth, and there is popcorn involved as well. What more could you ask for? The movie began with a great start, telling the real rivalry story between two formula one racing drivers, James Hunt and Niki Lauda. The movie is set in 1976 and follows the rise of fame for each driver and how they competed to come first in each race. Then it shows how Niki got trapped in his burning car after crashing it in one dangerous track he tried to avoid racing in, and how after a few weeks and two races, he did go back to racing despite the amount of pain he must have suffered then. 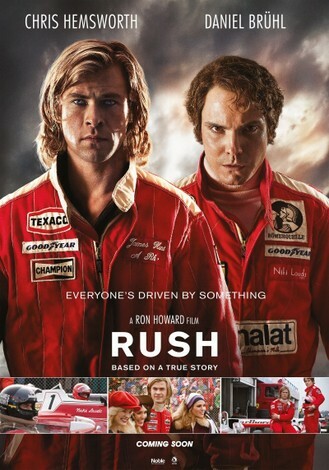 I of course didn’t know Niki Lauda or James Hunt but I have to say I thought the star of the movie wasn’t Chris Hemsworth who played James Hunt but rather Daniel Brühl who played Lauda and was captivating. My favourite part of the movie was when Lauda asks for a lift from two Italian guys who recognise him and let him drive their car, and it’s also worth noting that when the cars in the movie race, you can almost feel the chair vibrating in response and it’s like you are in that racing car yourself. The movie of course has a handful of censored scenes but they don’t destroy the flow of event much, you can still understand what’s going on. I also suppose people didn’t swear as much in 1976 as they do now so there were barely any muted swear words in the conversation. However, there are a few bloody scenes that are not for the faint hearted so if you get queasy watching blood on the big screen you better sit this one out. Anyone who loves car racing would enjoy this movie and anyone who doesn’t know much about car racing -like myself- would also enjoy this movie because it tells the story of real determination. I enjoyed every minute and I would certainly add it to my DVD collection. Thank you Cinescape for the opportunity to preview the movie which will start showing today Wednesday in Cinescape theatres.